Kenneth D. Krier is a Principal in Cummings & Lockwood's Private Clients Group and is based in the Naples office. 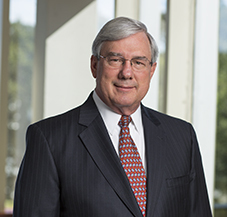 Since 1975, he has focused his practice on estate and tax planning, charitable giving and estate and trust administration. Ken moved to Naples from Fairfield, Connecticut in 1984. His wife, Beth Krier, is a Circuit Judge for the Twentieth Judicial Circuit of Florida (Collier, Lee, Charlotte, Hendry and Glades Counties). They have four children between them.